We conduct fieldwork in Antarctica followed by lab analyses to better understand the geologic evolution of the Transantarctic Mountains. This site provides updates from the field and information about our ongoing research projects. Our camp is called Gabbro Hills despite that we are actually in the Lillie Range. But we are in the same rock units as Gabbro Hills. We have been collecting rocks for three days and are already packing 1400 pounds of rock. Today we were especially victorious because we actually found gabbro! In 1400 pounds of rocks, there is only one sample of gabbro, the rock that this area is named after. It has been surprising to not see it sooner. This area is special to the Transantarctic Mountains because it might be the only place with exposed basement rocks for gleaning information about what is hopefully the depleted mantle end-member of igneous rocks prior to the Ross Orogeny granites. Things are going well so far. We are surrounded by stunning granitic spires under clear sunny skies in 15-30 degree Fahrenheit temperatures on Le Couteur Glacier. This is an incredibly beautiful place. I doubt that many people have the opportunity to travel across glaciers in a terrain like this where only a few people have ever explored. We were on an outcrop yesterday and spotted about 10 paleomagnetism bore holes likely from the 1995-96 expedition season led by Anne Grunow. Incredible! Yesterday we finally left Miller Range. We got the word that two flights were coming for us and the previous week left us feeling skeptic that any flights would actually arrive. But suddenly it was 9:30AM and there were two Twin Otters and Evan, our guide, with them to help us tear down camp. We woke up thinking we would likely be staying another night and by afternoon we were unloaded at Shackleton Camp. I need to shout out for Shackleton Camp. This is a deep field support camp that is established every few years. It was put in last year and will exist until next year. There are about seven people based there for operations, weather, field coordinator, and more. On top of the skeleton crew, there are two additional personnel (pilot and first officer) for each plane at the camp. There is the perfect amount of infrastructure in place. We were issued a tent each that was already up and clean and warm. The galley building is heated and there is a cook creating delicious warm meals. There are privacy pee holes and toilet shacks. The best part by far was taking a hot shower (no soap) and putting on clean clothes. So amazing to finally comb out my hair and not smell like the previous four weeks of no bathing. This is the longest I have gone with no bathing. I have been out on excursions many a time, but never where there is no opportunity to jump in a lake or river for rinsing off. We were only in Shackleton for a quick overnight, but it was a super morale booster. Now it is November 30th and we are in the stunning Lillie Range next to Gabbro Hills with camp set up on a pillowy snow covered glacier. What a life. 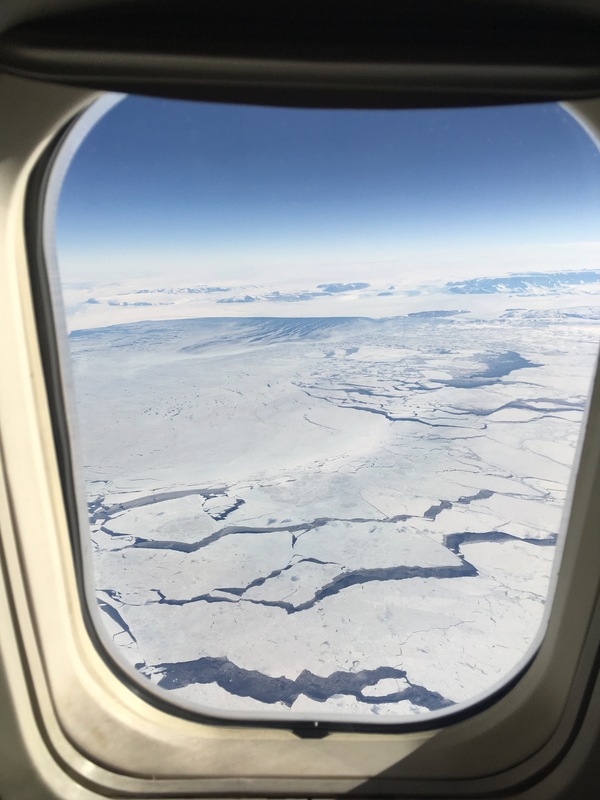 We’re finally en route to our next camp location in the Transantarctic Mountains after a cold month in the Miller Range. Realistically only about three or so weeks of that were actually cold considering a long delay in which we were trapped in a single tent trying to stay warm. I had never spent that amount of time in a sleeping bag. John seemed to settle into the new lifestyle easily, as if he hibernates regularly. He broke from his hibernation only to demand cups of tea or to call McMurdo Station hoping to hear news that a plane was on its way to move our camp. That plane would ultimately take seven days. But now we’re transiting through a large established deep field camp on the Shackleton Glacier. 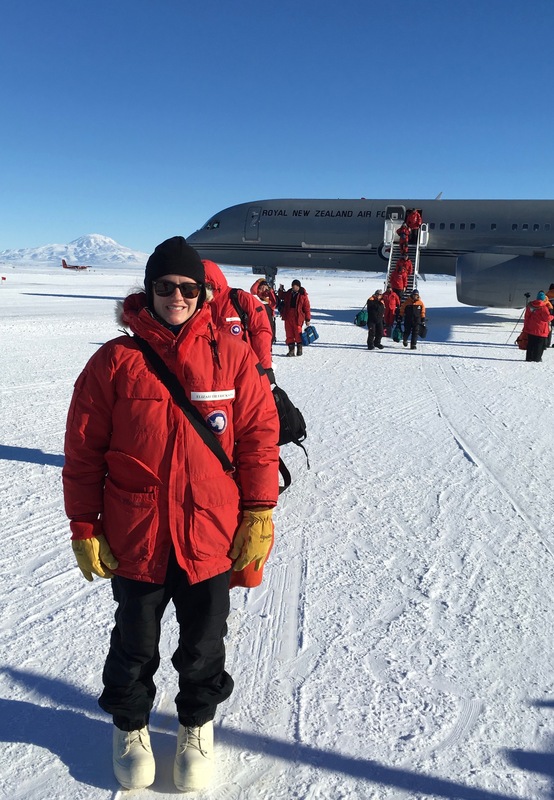 The camp is home to approximately 15-20 staff, pilots, and scientists at any one time and provides hot meals, hot showers, and heated tents—i.e., the closest thing to an Antarctic oasis. The problem is we’re only here for less than 24 hours. Tomorrow we’ll hop on another flight and head for the Gabbro Hills region to set up camp all over again. We’re farther south than we were previously but we’ll be crossing our fingers for good weather. The last month has been filled with 30+ kt winds, fixing skidoos in our living room, and exploring the far reaches of the Miller Range that looks out over the East Antarctic ice sheet. The experience brought with it a new sensation: the feeling of your finger nails separating from their cuticles due to freezing temperatures. Currently they feel similar to a loose tooth but for all your nails. The next couple of weeks will hopefully be filled with sunny days, beautiful mountains, and interesting geology. But it will more likely be filled with hazardous crevasses, lengthy climbs carrying bags of rocks, and bone chilling temperatures. Unfortunately, Captain J-Bird won’t be joining us for the latter half of our field season. A mountaineering guide named Evan will replace him and be tasked with keeping Elizabeth and I alive… and carrying all our rocks. Yesterday we discovered that one of the rear suspensions on the skidoo had busted. 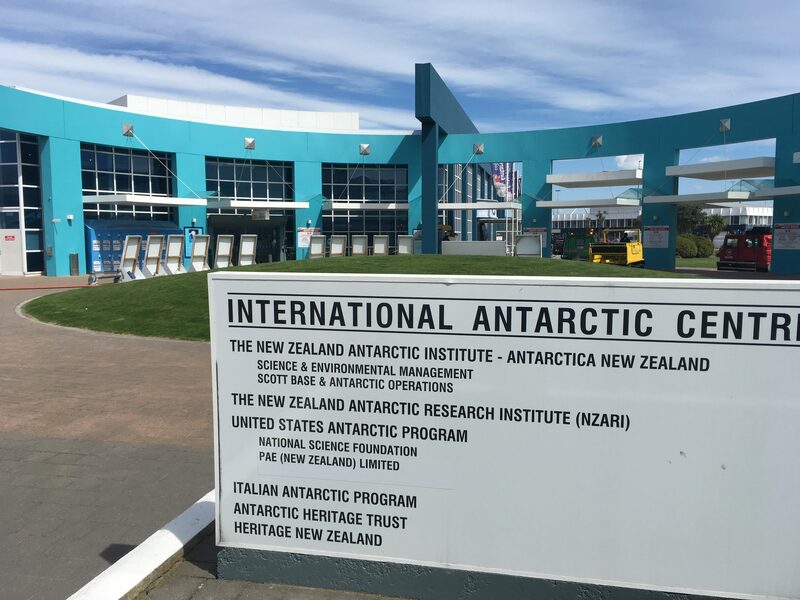 Today we fixed it. Since it was 20 knot winds blowing heaps of snow, we came up with a plan. We would put the skidoo into the tent where we would all be protected. We cleared out half of the Endurance tent (our main kitchen and work tent), we dug out the makeshift toilet behind the tent, we unzipped the tent from its base, and then literally drove the skidoo into the tent. We jacked up the rear of the skidoo, unscrewed the back wheel axel, removed the right rear suspension, put on the spare, and viola! We fixed the skidoo. And then we broke a tiny plastic piece somewhere else in the process. Regardless, our mission was a success! Top most ridiculous moment of the season so far. 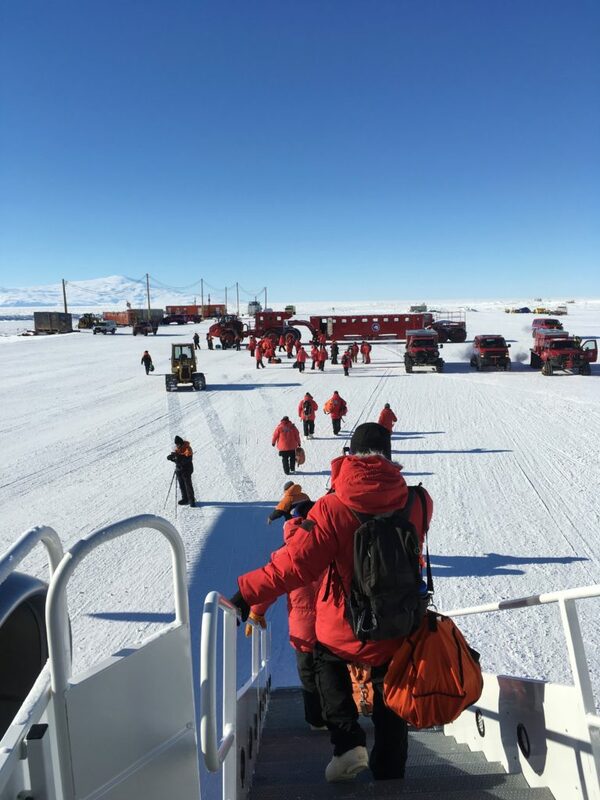 This time last week, we and all 4000lbs of our camping equipment were loaded into a DC-3 Basler and flown 2.5 hours, or about 650km, south from McMurdo Station to the Miller Range. After quickly unloading all of our gear, the plane departed leaving the three of us to set up our home for the next three weeks. Since arriving, we’ve had near-constant winds of 20 – 30 knots which makes doing fieldwork challenging, but the daily skidoo commutes and the stunning scenery more than make up for frozen hands and faces. We’ve been hard at work each day collecting lots of samples, and finding lots of interesting rocks to look at. I’m sure by the end of the field season we’ll have more than enough to work on for the next year! Tomorrow our three person team, and ~5000 lbs of gear, will depart via fixed-wing aircraft for the Miller Range in the Transantarctic Mountains. There we’ll set up the first of two small remote field camps that we’ll use throughout our six-week field season. Our camp locations this year are farther afield and more southern than last year and, consequently, we’ll be exposed to lower temperatures and more hazardous terrain, including glacier travel. These extreme conditions ultimately require more preparation and training, so we’ve spent much of our last two weeks at McMurdo Station, Antarctica, taking skidoo training, crevasse rescue training, deep field training, etc. These trainings, daily meetings, and gear preparation have left me grossly out of touch with the rest of the world, despite the fact that we’re currently living in a research station with an approximate population of 1000. Nevertheless, I’m eager to unplug further and live in a remote camp with a population of 3. It’s a particularly interesting time to be out touch with the world. Last year when we returned from two months in the field we learned that Adele must have poor cell phone service and people care about Justin Bieber again. This year is different. This year is a presidential election year. And when I’m skidooing across a glacier, or hammering off pieces of rock with chattering teeth and a runny nose, many of you will be casting your ballots to determine the future of the United States. If you agree to Keep America Great, I’ll agree to Make Antarctica Great Again… whatever the hell that means. 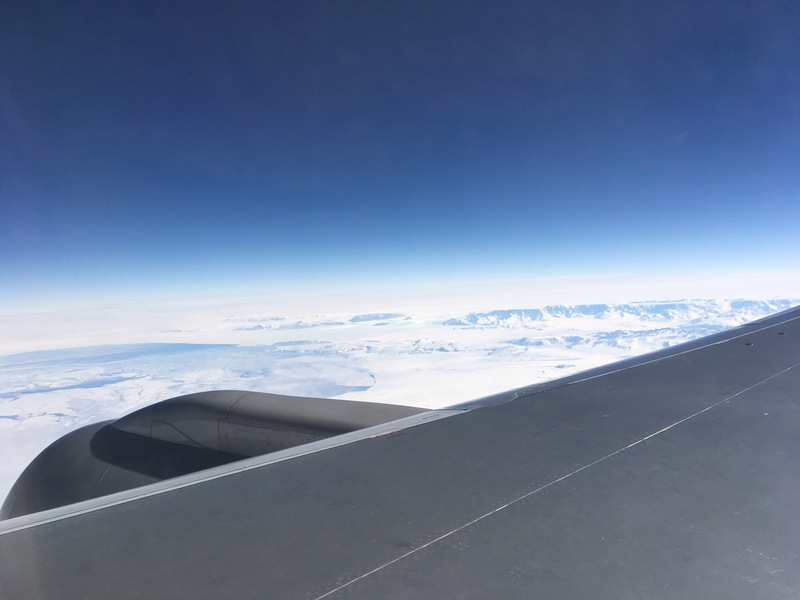 In a few short days I will depart the sunny coast of southern California and arrive at McMurdo Station, a research center on the south tip of the Ross Island at the far edge of the Ross Ice Shelf in Antarctica. As unbelievable as that sentence still sounds to me, it is true, and I am excited! My UCSB research companions are Dr. John Cottle and Demian Nelson. We will spend a short time at McMurdo and then spend about six weeks in the field, almost completely cut off from humanity, all things living, and colors beyond brown and white. This will be my first time in Antarctica. The things I can foresee are average temperatures between -30 and -40 degrees Celsius (Antarctic summer time! ), hidden crevasses littering a glacier covered terrain, and high potential for rapid and extreme weather changes. Logistically, I can expect no laundry, no showers, collecting all waste into buckets, and carrying around tons of rocks that we will hammer off of exposed outcrops. 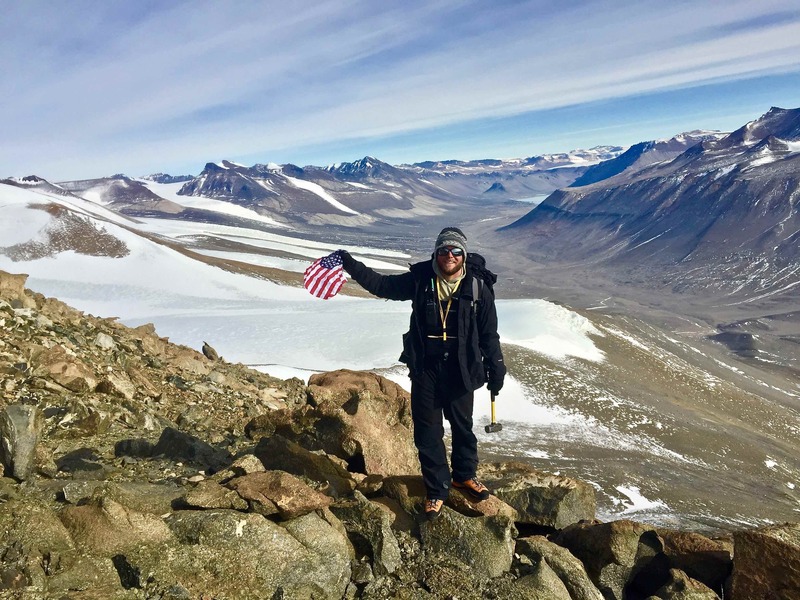 What I cannot yet fathom is collecting rock samples from the Transantarctic Mountains within 7 degrees of the South Pole, in one of the most remote and impressive field areas. This means that I will not be at a station, but camping on ice and relatively exposed to the elements. My mode of travel will be on foot and by skidoo. This will be an amazing experience! We are gearing up to depart for a new field season in just two weeks time. We’ll update you on our preparations soon, but in the meantime, here are a few panoramic photos from our last field season. McMurdo Sound from Hobbs Hill. Ross Island and McMurdo station are center left on the horizon. Buddah Lake with the Joyce Glacier peaking around the corner on the right. Here’s a video of our field season made by Demian – enjoy!